Acupuncture is a traditional Chinese approach in which the internal energy navigates throughout the body alongside the channels known as meridians. Whenever an illness occurs, the normal flow of energy gets disrupted. This medical practice is helpful in resolving the health issues like back pain, neck pain, knee pain and migraine problem in humans. At Sandalwood Physio, we believe in traditional and natural means of body healing. 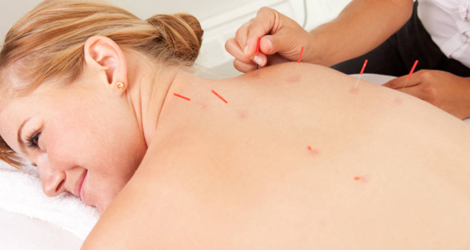 Our goal is to help patients in regaining their health using acupuncture. On your first visit, our team of acupuncturists in Brampton will evaluate your problems and health issues to determine your actual condition. We'll record the problems you are facing and from how long. After providing the acupuncture treatment, we advise our patients to have a healthy lifestyle, positive attitude, proper diet and regular exercise. Whenever an acupuncture treatment is done, the relaxation response in the ailing body part gets stimulated. It works by affecting the nervous system and activating the certain brain chemicals. The acupuncture needles are responsible for affecting the certain trigger points that stimulate the relaxation in muscles. In this way, the pain and muscle tension is reduced and relieved. Call Us Today To Schedule An Acupuncture Treatment!